beautiful! i love your ideas! This is gorgeous and exactly what I was unknowingly looking for. Is this just one skein of each color? I just cut it every time. I’m sure there’s a way to avoid that, but I haven’t researched it. Slip stitch across the top of the stitches from the previous row until you can slip stitch into a ch 1 space and then begin your row from there. Then you will only have to cut your yarn when you change colors. Thank you so much for this pattern! I just finished crocheting a blanket and its so adorable! How sweet…our first great grandchild is on the way. I reread the article but like a few others, am wondering how much of each color did you purchase? Thanks so much for the pattern! This is beautiful! How many yards of each color are needed? I used less than one skein of each color for this size blanket. Hi, you mentioned one skein of each color, which brand and how many oz was each skein. 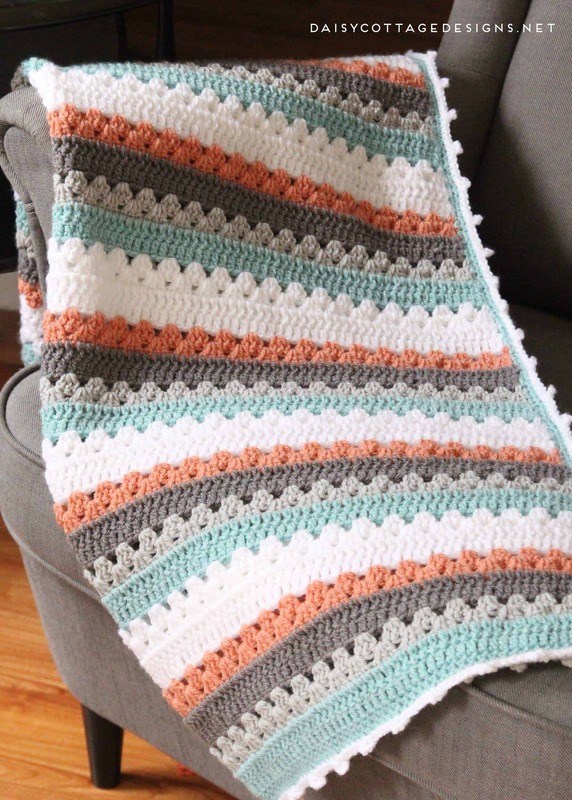 I would like to make a baby blanket. I used Lion Brand Yarn Cotton Ease. The balls weigh 100 grams. Hi, what is the begining of this pattern please? Do you magic ring &amp; how many?? I can&#39;t seem to start this. Hello this is soo pretty. I&#39;m a beginner and am not sure how to make this larger. What do I do? How do you get it to not start bunching up and looking like ruffles? I was wondering how I could make this pattern bigger for an adult size. Can anyone tell me how I would do that? That is correct what Cute N Crocheted said. I love this pattern. It is so adorable. Shouldn’t you add extra at the corners to make it bigger? You just keep doing the same thing – one cluster on the sides, two in the corner separated by the chain. 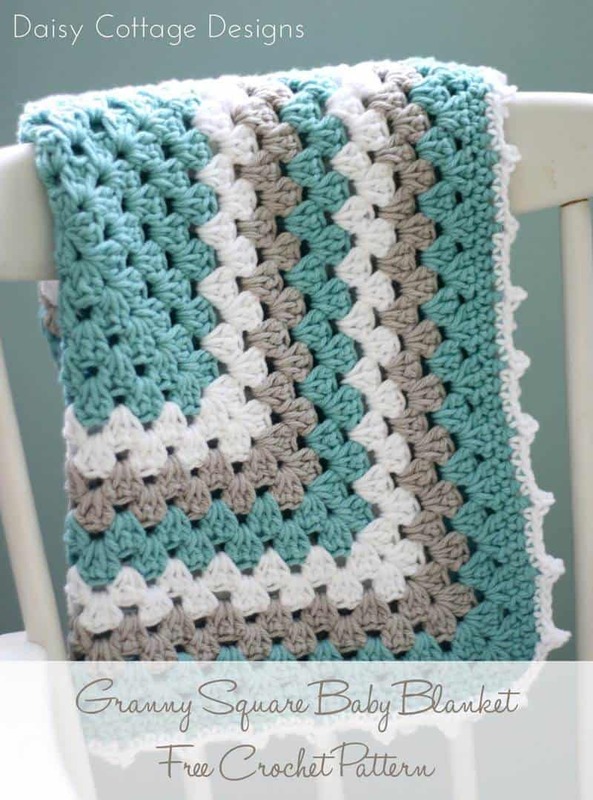 I have been looking for a pattern just like this, except I want it to be in an adult size rectangle form! Can you tell me how to do this? Love this pattern! Great for any skill level. Thank you so much for this beautiful pattern. I made one for my friend for her baby shower. She simply loves it! I had a hard time finding the snow yarn. So I used a different yarn all together but it still came out beautifully. I wish I could show you the blanket. Thanks again. I&#39;m really having trouble with this pattern and I&#39;m not entirely sure why. Round one gets done just fine, but when I try to move past that, my work ends up circular and it curves inward like a hat. It gets worse if I can actually get to round three. Am I stitching too tightly? I have a quick question about round 2 of the border. Where did you start the round? The same place as the others, on the corner or somewhere else? Thanks so much! My best friend just had her babygirl and I cant wait to make this blanket for them. Sooo cute! Thanks! 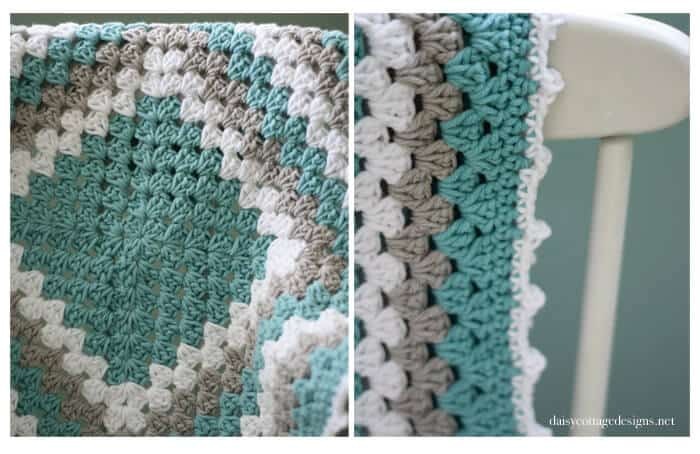 I am going to make this blanket for a baby girl. I would like to make it bigger in 3 colors also. Please tell me how many skeins of yarn I will need to make it about 36&quot; x 36&quot;? Thank you. You crochet beautifully. Lauren herself said she used less 100 grams. I suggest you get 2 skeins of each color, but you will likely need a bit less than that. I have made this blanket twice. It appears that the inside square is off from the rest of the blanket? Like it&#39;s crooked.. Am I doing something wrong? Thank you for your time.. Started this blanket yesterday and I am absolutely loving it. Simple, but beautiful! Thanks so much for the pattern! Could you help me I’m having trouble getting started? I am a beginner just to put it out there, but in round 1 I did the dc in the first ch 3 times and then with the sl st i get confused. Do i do it just at the end of the last dc or into chain 2? Or. .? Making two simultaneously 1) purple white and pink, 2) baby pink gray w/rainbow variated ribbon and white. Even made a flower in the grey outlined in pink fot the 2nd one! Super easy pattern! I noticed that no one ever got a response to their questions. I personally started it off with a magic circle since it was not working out with the round 1 instructions. For those wondering how to make it larger all you do is keep add rounds until you have reached the desired length before starting with the border instruction. I hope this helps everyone out. I’m a beginner! Need help! In round 1, I’ve got to the point of sl st to the top of the chain. .. Now what? It says “you will have 4 dc and 4 ch 1 spaces at the end of the round” do you keep going another couple times or are you done? I’m confused. .
does anyone know how to print this pattern and tutorials without downloading pdf software that is on the site. All you have to do is drag the Print Friendly into your favorites bar – it’s so easy! 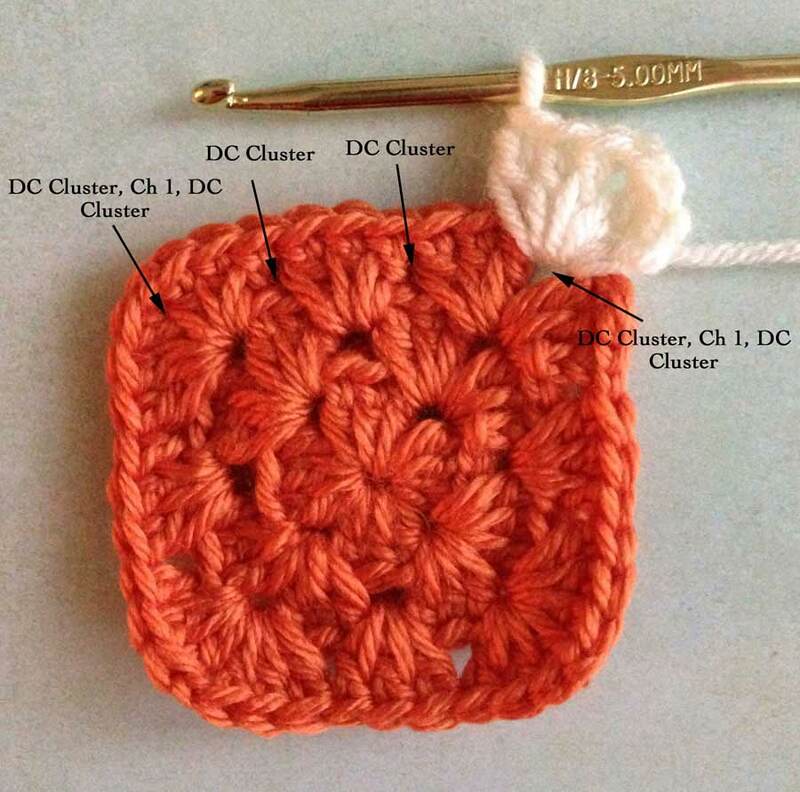 I just started this pattern and discovered that what she calls clusters is not what I am used to. If you make three dc when she says a cluster, it works up perfectly. My center square is skewed. I started again and started turning after each row and it looks much better; however, I’m having difficulty with the join as I can’t figure out how to do the slip stitches so they don’t bunch up. Can you help? I’m working on a big granny afghan now and I’m noticing a slight pucker as I go. Is this normal? I’ve never made one of these before. Is it necessary to turn the work and work with wrong side facing me? very upsetting that the free patterns are not able to be printed instead of downloading. I am not real good with the computer and my computer does not have the ability to down load and printing the whole thing (comments and all) is a waste of paper and ink. You can use the print friendly button on the sidebar to print everything without ads. hello, what a darling pattern. I noticed the directions say to use an “I” hook, but in the pictures, a “H” hook is being used. Suggestions? Thank you, I can’t wait to begin this project! I don’t, but I know some people do in their granny squares. If you use the magic circle, how many stitches do you need. 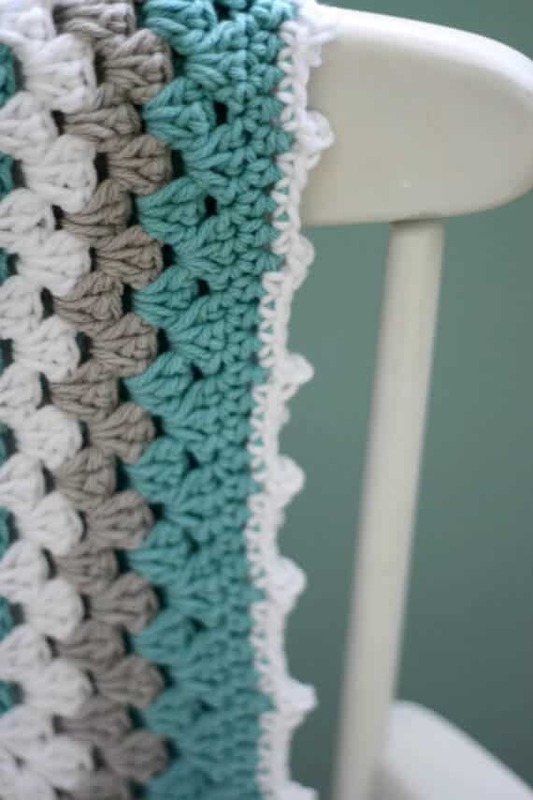 I love this pattern, but I am a beginner and I can’t get started. Mine has 2 strands in one of the sections and 3 in the other 3. I don’t know what slip stitch into the next 2 and then into the space means. I would appreciate any help from anyone! I would like to make this as a baby blanket, about how much yarn will I need? 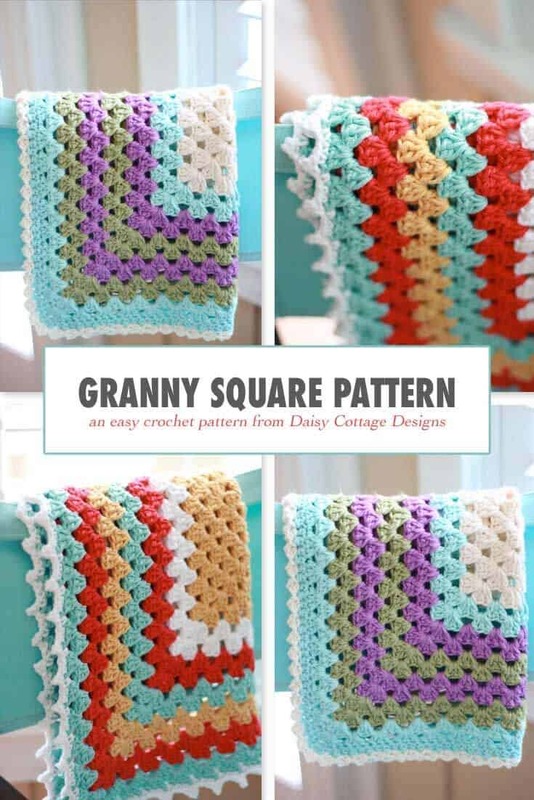 I love this pattern and so glad you have shared it. Thank you for this beautiful pattern. I need to start on a baby blanket for a friend and found your pattern yesterday. Beautiful colors and will be perfect for the little one. Keep doing what you do best! I love the color combination on that blanket. I love your hats patterns too. I really like this pattern the colors are so beautiful together. I really would like to make this! Love this pattern! It’s perfect for baby gifts. I’m sending one off to my cousin this week! Thank you for such an easy, gorgeous pattern! How do I go about expanding the pattern to full size? Just keep working. You’ll make two clusters in the corner and one everywhere else. Mine is about 18″ square. It’s very easy to keep adding rounds by following the pattern for the previous round.